A South Texas nature refuge's 14-month legal battle against the feds was derailed as Congress moves to shield the refuge and Trump declares an emergency. UPDATE: A federal judge on Thursday dismissed the National Butterfly Center’s lawsuit and motion for a restraining order against the Trump administration over border wall construction in South Texas. The Washington, D.C., judge ruled that the administration had legally waived a suite of environmental laws in October, making obsolete the butterfly refuge’s claim that those laws were being violated. The judge also rejected the refuge’s constitutional arguments, in part because the center is located so near the U.S. border — within the so-called constitution-free zone. The refuge could file a new suit with tweaked versions of its constitutional arguments. Meanwhile, President Trump signed legislation Friday that exempts the butterfly refuge from wall construction, along with sending 55 new miles of border wall to the Rio Grande Valley. Trump also moved Friday to release some $6.7 billion in wall funding using a combination of executive authority and an emergency declaration. According to a senior White House official, the money from that action could be used to build on the butterfly refuge and other sites that Congress is seeking to protect. At least two lawsuits have already been filed by Texas landowners and environmental groups in federal court to stop the president from accessing most or all of the $6.7 billion. ORIGINAL POST: Late Monday evening, attorneys for the National Butterfly Center asked a federal judge to block the Trump administration from building a border wall at the refuge or using the center’s property as a pass-through to build elsewhere. 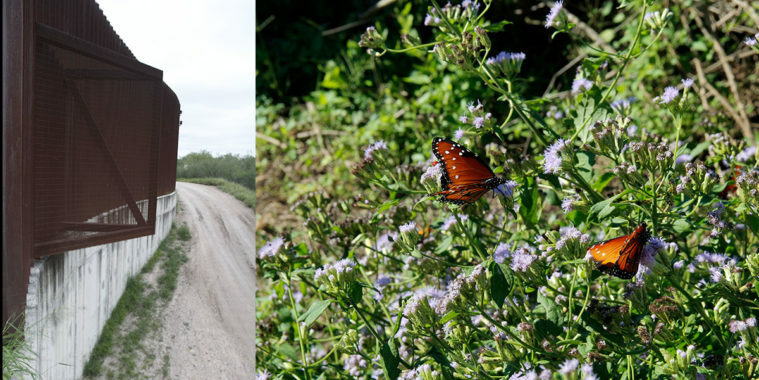 The motion alleges that federal agents and contractors have been driving without permission through the Rio Grande Valley refuge’s property to access nearby federal land for the last week, and that they even replaced one of the butterfly center’s gate locks. The Trump administration plans to break ground on a 6-mile stretch of border wall as soon as this week, starting with a federal wildlife refuge tract just upriver from the privately-owned butterfly center. The motion accuses the Trump administration of “defy[ing] centuries of democratic values that shield Americans from government action depriving individuals of their rightful property without notice and an opportunity to be heard.” It calls for the Washington, D.C., judge to temporarily forbid the government or its contractors from taking any action at the refuge “in furtherance of the construction of a border wall” or from interfering with the center’s “use and enjoyment of its property” — apart from Border Patrol agents stopping the “illegal entry of aliens.” The motion is part of an existing lawsuit, filed in December 2017, that contends the wall is being pushed forward in an illegal and unconstitutional manner. Clashes between the National Butterfly Center and the government aren’t new. In summer 2017, Executive Director Marianna Treviño-Wright discovered a crew of border wall contractors using heavy equipment and chainsaws to clear brush on the property — even though the feds hadn’t acquired the land and Congress had not yet authorized any wall funding. This and other alleged intrusions led the center to file suit against the feds later that year, alleging violations of the Fourth and Fifth Amendments, along with the National Environmental Policy Act and the Endangered Species Act. The Department of Homeland Security later waived the environmental statutes, but the butterfly refuge’s attorneys maintain that the waiver was illegal. Monday’s motion asks the judge to temporarily halt the government in its tracks before it damages the refuge’s property, delaying construction until the judge rules on the 14-month-old suit. Ultimately, the center hopes that the judge will force the government to slow down and perform rigorous environmental surveys, consult with other federal agencies and give the public a chance to weigh in — rather than plow ahead with construction as soon as this month. The Justice Department and other federal agencies still haven’t seized land from the center using eminent domain. If construction is ever allowed to proceed, the refuge’s leaders contend their project will be devastated. An earthen river levee that runs through the 100-acre property would become a 30-foot concrete-and-steel border wall, bisecting the reserve and leaving more than two-thirds of the land stranded on the wrong side of the barrier. The wall will be littered with cameras and draped with at least 22-foot tall LED lights, a potential catastrophe for sensitive insects. Tourism to the center could crater, forcing the center to close and wasting 17 years of effort cultivating the refuge. On Saturday, according to an affidavit filed by Treviño-Wright, a refuge staff member escorting a group of high schoolers to the part of the property nearest the Rio Grande found that the center’s “lock and chain had been cut off the gate and replaced with a [Customs and Border Protection] lock, which prevented our employees and visitors from accessing the majority of the Butterfly Center.” CBP did not immediately respond to a request for comment.